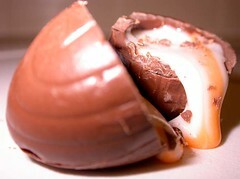 Australian Chocablog reader MillyMoo sent us her own very personal “Creme Egg Story” from last year. We love it. Only Creme Egg could inspire such heartfelt prose. A quick reminder – Easter is coming up fast again and Creme Eggs are back in the shops. .. mmmmm… *slurp*…. “Oh dear, sweet, accessible Cadbury Creme Egg. My fillings ache just by glancing over at you, glistening in your primary-coloured foil, stacked in a fetching pile near the check out. Easter may have just ended, but you manage to linger on. Why is it that you, of all the commercial holiday refuse, remain at full price and all of the other pretenders to your throne (Red tulip, Cadburys, Heritage, even Lindt) are now thrown into a cardboard box emblazoned ‘50% Off’. They’re not fit to be seen next to you. All are disfigured – crudely broken, holes picked into their sides from sticky little fingers, smashed into fragments or their boxes dented unbecomingly. I may have spent the four days of Easter long weekend dreaming of you, but you were never made a reality. No-one gave me any of you – I would have smelt and sensed you long before you were plonked out on the kitchen table for Sunday morning anyhow. Don’t fret, little egg: I made do with many mournful mouthfuls of rabbit ears, dark squares, M&Ms and anything that my daughter Sapphire wished to share. Of course it wasn’t enough: it wasn’t what I really craved. That, dear Creme Egg, was you. And so, two weeks later at the supermarket I now find my hands excitedly fumbling for my wallet; coins spinning on to the moving checkout belt. My surrender is now complete. The family groceries are paid by credit card but the pack of six Cadbury Creme Eggs are paid in cash, like a guilty secret, and shoved into my backpack before anyone else can see. Like a true addict, I fidgeted nervously and looked around for a secluded spot to eat one. Not out in the sunlight where it would be too public and possibly offensive for people to see, but in the shade, at the side of a building or beside a…….. the alleyway by the cinema! My feet were yearning to run like the wind instead of badly act out the casual saunter my brain was imposing upon them. It wouldn’t do to have someone else guess my purpose; I was never ever going to share. 1-All contestants must bring 6 eggs to designated place of competition. 2-All contestants must donate £2 to a prize fund. 3-Contestants write the maximum number of Creme eggs that they estimate that they can get in their mouth WHOLE at the same time on a piece of paper and lay it face down on the table. 4-At a given time, all contestants hold their paper up to be seen by the rest of the contestants. The contestant with the highest number must then attempt to achieve the goal. In the event of a tie, all contestants with this number must attempt the challenge. 5-If the contestant/contestants achieve the number of eggs, and after successfully eating them, they win the prize fund. 6-If the contestant/contestants fail, the contestant/contestants with the second highest figure on their paper shall attempt it. haha, easter egg challenge sounds good! we have tried to show people how to eat a creme egg. I love them but Lucie isn’t so keen! Oh dear. Are you related to the Fast Food Rockers? Because I… um… well, I used to er… work for them. I can’t believe I admitted that in public.